The Insatiable Critic: Summer Shorts '14 Bonus Listen Friday: The Cask of Amontillado in Full Gothic Glory! Summer Shorts '14 Bonus Listen Friday: The Cask of Amontillado in Full Gothic Glory! Sadly my friends, this is the last Bonus Listen Friday of the month, but it has been so much fun sharing and promoting this collection! And we're ending June is Audiobook Month (JIAM) in full goth form - with Edgar Allan Poe's The Cask of Amontillado! Originally posted on the blog Jenn's Bookshelves, the performance features William Dufris and the AudioComics Company giving a singularly creepy rendition of this classic tale. After hitting the play button, we are greeting with the sounds of rain, then a door creaking, followed up by the menacing strains of an organ. Mr. Dufris does an excellent maniacal laugh that betrays the well-adjusted facade of his urbane voice as our narrator, Montresor, who is planning to take revenge on his friend Fortunato, over what seems like a pretty weak excuse. Over a tense, 17-minute time frame, the plot takes on deeper and deeper twists as we are led down into Montresor's the nefarious wine cellar to where he will supposedly show his friend a particular rare vintage. This production paid great attention to the details within Poe's famous story. We can hear the bells jingle on Fortunato's cap, as he is described as wearing a jester's cap for Italian Carnival, and strains of festival music that recede farther in the background as Fortunato enters Montresor's lair. Water drips, sounds echo. Fortunato has a hacking cough that is eluded to in the text but brought to life to a disturbing effect. Montresor urges the man to go back several times (perhaps having a change of heart regarding his nefarious plans?) saying that the dampness of the cellars is no good for his condition, but Fortunato, perhaps out of pride, presses on. Towards the end, we are convinced that both characters have gone completely mad, if their unhinged laughter is any indication. Poe has always had a special place in my heart, and I'd like to think he would really enjoy sitting back and seeing his tale retold with the dramatic voices and sound effects bringing forth such depth and passion. The Cask of Amontillado is a part of a Summer Shorts '14, a collection that is the product of a collaboration of Spoken Freely and Tantor Media, Inc. All proceeds from the sales of this collection will go to support ProLiteracy, a nationwide organization to that provides adult learning, content, and programs to help adult learners and advocate on their behalf. Get hopping! The collection costs only $9.99 until June 30, after that the price goes up to $14.99. To find out more about the project, visit Xe Sands' blog Spoken Freely. And thanks for joining me on this fun listen through the best of classic literature and poetry! 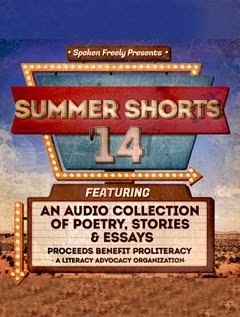 Summer Shorts '14 Bonus Listen Fridays!